The Innsbruck Festival of Early Music runs annually for about three weeks during August. It was founded in 1976 and since the start has focussed on Baroque opera, in recent years usually performing three each season. Between 1991 and 2009 René Jacobs was the director of the opera programme and, from 1997, the entire festival. Since 2010 the festival has been directed by Alessandro De Marchi, who instigated the International Singing Competition for Baroque Opera Pietro Antonio Cesti, named after Antonio Cesti, a 17th-century Italian singer and composer who served at the Innsbruck court of Archduke Ferdinand Charles of Austria. The focus this year was on the music of Monteverdi, and included a staged performance of Il ritorno d’Ulisse in patria. Unfortunately, I was only able to attend for three days, so my review is necessarily limited in scope. In a well-planned programme of dance and music, Les Talens Lyriques and the dance company Les Cavatines brought Rameau’s Acte de ballet: Pygmalion to life. They opened with a first half of Rameau’s rousing Les Fêtes d’Hébé ou Les Talens lyriques, forming an overture segueing into Clérambault’s solo cantata La Muse de l’Opéra ou les Caractères lyriques. The soloist was Chantal Santon-Jeffery, wearing what seemed like an entire ostrich on her head, and showing dexterity in Clérambault’s distinctive ornamented vocal lines. The dancers of the Compagnie Les Cavatines were initially encased as living statues within a grand throne-like construction, moving out to depict the various images supporting the muse. The dancers then returned to elaborate on Rebel’s whistle-stop tour of Les Caractères de la Danse, clad in bright-red cassocks that looked like a cross between a Turkish Sufi dance troupe and the Westminster Abbey adult choristers on a night out. Their energetic and visually engaging dancing was choreographed throughout the evening by Natalie van Parys. Dance was also the focus of Rameau’s Pygmalion, who asks the Charites to teach him a range of different dances, including the Minuet, Gavotte, Chaconne, Passepied, and rigadoon. Anders J. Dahlin sang the title role, his clean and focused voice allowing the subtlety of French Baroque ornamentation to be heard clearly, unhindered by unnecessary vibrato or other vocal mannerisms. Jodie Devos sang the role of L’Amour, with similarly good control over her voice. Chantal Santon-Jeffery sang the role of Céphise, while Magali Arnault Stanczak took the role of La Statue. This was an extremely well thought out production, with elaborate costumes which changed almost imperceptibly from period to hip, and sympathetic lighting. The playing of Les Talens Lyriques under Christophe Rousset was exemplary and included some fine flute solos from Jocelyn Daubigney. One of the highlights of the Innsbruck Early Music Festival is the annual Cesti Singing Competition for Baroque Opera. Each year, from the finalists and other competitors, several are chosen to form the cast for the following year’s BaroqueOpera:Young opera production, having sung many of the arias from that forthcoming opera during the competition finals. So several of the 2016 group of competitors returned for Reinhard Keiser little-known three-act Singspiel “The Roman Unrest, or The Noble-Minded Octavia”, usually referred to as just Octavia. It was first performed in 1705 in Hamburg’s Oper am Gänsemarkt. A competitor of Handel in Hamburg days, Keiser was acknowledged as “the greatest opera composer in the world” in Mattheson’s encyclopaedia of musicians. Although he is virtually unknown today, much of his music lives on in Handel who freely ‘borrowed’ from Keiser. For example, ten of the arias from The Roman Unrest later appeared in Handel operas, six of them in Agrippina. It has a complex plot, based on the time of Nero but focussing on the character of Octavia, at the time, Nero’s unfortunate wife. Nero wants to marry the Armenian Queen Ormoena, so orders Octavia to commit suicide. The resulting story line is enlivened by a series of subplots and various twists and turns, helpfully set out in this schematic. The orchestration is surprisingly rich, although on this occasion the instrumentation was necessarily reduced. One aria calls for no fewer than five bassoons, here reduced to two, with an oboe da caccia taking the higher bassoon line. The 18-strong orchestra (under the name of Barockensemble:Jung, so presumably assembled for the occasion) was directed from one of the two harpsichords by Jörg Halubek. They were positioned to the right of the stage, but the consort held together well, particularly as the whole thing was performed in the open air and there must have been acoustic implications for the musicians. Particular credit must go to the two horn players, Nina Daigremont and Maria Antonia Riezu Gonzalez. The singers were all impressive, although there was rather too much vibrato from a few of them for my taste, and for the period of the opera. This is a common issue with young singers, who seem to be taught to develop vibrato at an age when they do not have the experience to control it. Morgan Pearse and Suzanne Jerosme took the key roles of Nero and Octavia, both excellent singers and actors, both managing to control vibrato, as did Federica di Trapani as Ormoena and Roberto Jachini Virgili, who had fun portraying the role of the buffoon Davus. One lovely aspect of staging da capo arias came with Octavia’s Geloso sospetto – the one with five bassoons. It was mostly sung from a bed, and during the B-section Octavia hurls all the pillows onto the floor in anger, only to spend the da capo repeat of the A-section putting them all back again. Within minutes Livia (Yuval Oren) had thrown them all off again. With a final ending time of around 11.35pm, there could have been a few more cuts, the timetabled ending time passing with a complete Act still to come. But overall this was an impressive performance, well directed, musically and in terms of staging and visuals. I only managed to hear a few of the first round competitors in this year’s Cesti competition, but on the basis of what I heard, I am looking forward to hearing next year’s BaroqueOpera:Jung performance of Cavalli’s Gli amori di Apollo e Dafne. The Austrian mezzo-soprano Sophie Rennert won the audience and second prizes in the 2016 Cesti competition. For this recital, she was joined on theorbo by fellow Austrian David Bergmüller. Those expecting a gentle and intimate musical experience in this tiny chapel (tucked away in the corner of the Ambras Castle) were in for a shock, for this was a full-blooded performance of intense and powerful music, generally based on the fate of spurned lovers, and sung with considerable gusto. The opening prologue of La Musica from Monteverdi’s L’Orfeo set the scene, followed by his Lamento d’Arianna with its rapid changes of mood and emotion, aspects of his other pieces Ohimè ch’io cado and Disprezzata Regina from L’Incoronazione di Poppea. Further pieces in similar mode came from Luigi Rossi (Lasciate Averno from L’Orfeo), Sigismondo D’India (Piangono al pianger mio and Lamento d’Olimpia) and Jacopo Peri (Tu dormi e’l dolce sonno and Hor che gli augelli). Sophie Rennert engaged well with the audience and was very well received. Her voice was strong, but with rather too much vibrato for my taste, even at the lowest volume when many singers manage to control their vibrato. I was impressed with the theorbo playing of David Bergmüller, particularly his ability to play very quietly at times. One of the key themes for the Festival was Monteverdi, although this was the only concert during my brief visit to include his music. The local Tiroler Landesmuseum Ferdinandeum contains this Barnardo Strozzi painting of Monteverdi c1630. It is often forgotten that amongst his many other musical talents, Bach was also a fine violinist and, according to his son Carl Philipp Emanuel, continued to play well into old age. Most of his chamber works, including those performed in this concert, were composed during his time as Hofkapellmeister to musical Prince Leopold of Köthen, an appointment that did not require organ playing or cantata writing. The mirrored room where these pieces were first performed still exists, and is surprisingly small. Both there, and in later secular concerts in the coffee houses of Leipzig, the acoustic must have favoured the clarity of Bach’s complex contrapuntal writing. The same cannot be said of the enormous Riesensaal (Giant’s Hall) in Maria-Theresa’s Imperial Palace. It is an extraordinary space in a grand building, but is not ideally suited to music performance. The vast acoustic has nothing to absorb the sound, even with a capacity audience. Even from my seat, just three rows from the front row, the sound of the Akademie für Alte Musik Berlin was muddled and confused. Their playing, under the direction of violin soloist Isabelle Faust and their concertmaster Bernhard Forck was strong, punchy and very fast, and seemed to take very little account of the acoustics of the space. There was no need to force the sound into the space: the tiniest of sounds would spend an age wandering around the space. But only rarely did we get anything approaching the tiniest of sounds. Even when Isabelle Faust was playing quietly, the orchestral forces overpowered her, notably in the Adagio of the Concerto BWV 1042, where her entry was more-or-less inaudible. Another issue, common in a number of Innsbruck Festival venues, is the lack of ventilation, making it unpleasantly hot for the audience and wreaking havoc with the tuning of period instruments. But despite these issues, this was an invigorating concert of Bach’s most popular works, concluding with the Double Concerto BWV 1043. In contrast, it was good to hear Carl Philipp Emanuel Bach’s Symphony in B minor (Wq 182/5), a wonderful example of the Sturm und Drang style, on this occasion, played with added Sturm. For many years I was able to review the Cesti final as well as the BaroqueOper:Jung performance starring the previous years’ competition finalists. However in the past two or three years that has not been possible. But this time I was able to hear a few of the competitors in the first round of the Cesti singing competition, on 23 August. Around 170 people applied for the competition, of which around 90 were selected to come to Innsbruck. It is a big financial commitment for competitors who as well as paying an entry fee have to fund all their own travel and accommodation for the duration of the competition. Of the 26 that I heard, four made it through to the final. The final was live-streamed. Both during the broadcast final, and some of the competitors I heard live, I was surprised how many had vocal styles that I would have not have thought would have been considered suitable for Baroque, rather than a later period of opera. And, for a competition that is specifically geared to Baroque opera, several of the competitors that I saw really took the chance to demonstrate their acting ability, standing rather statically as if for a chamber music recital. Four prizes are awarded, of 4,000, 3,000, 2,000 Euros plus an audience prize of 1,000 Euros. 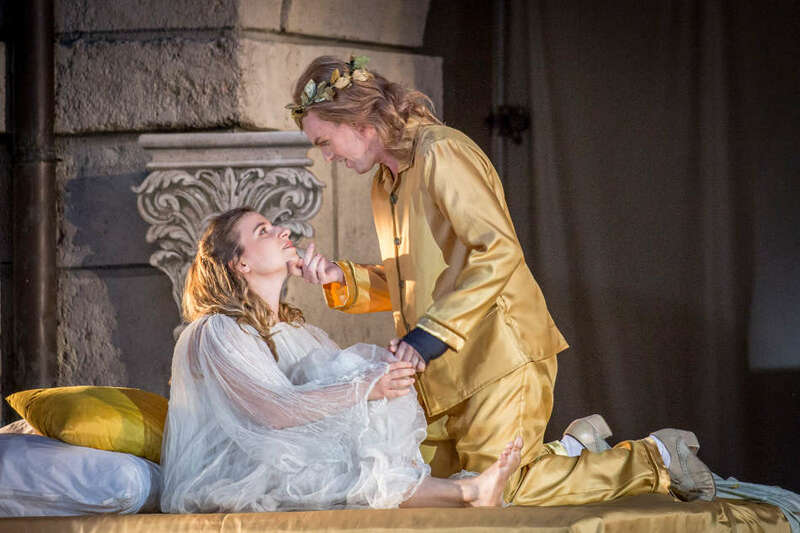 In addition, finalists can be offered roles in the 2018 BaroqueOpera: Jung production of Francesco Cavalli’s Gli amori d’Apollo e di Dafne and engagements at some of the festivals that were represented by members of the jury, most of whom were directors of opera houses or music venues. Competitors had to prepare five arias or scenes, to be sung from memory in their original language and key. For the final, one of their two pieces had to be from Cavalli’s Gli amori d’Apollo e di Dafne.